This post orginally appeared on the LSE impact blog: http://blogs.lse.ac.uk/impactofsocialsciences/. Options available to authors to make their work open access are on the rise. Adoption of open access itself is also rising, and usage of open-access materials is similarly increasing. However, alongside rising access levels another, less positive rise can also be observed: the costs of open access are increasing and at a rate considerably above inflation. Stephen Pinfield and Rob Johnson outline some of the key findings of the recent Monitoring the Transition to Open Access report, offer their own personal reflection on some of the policy challenges it presents, and suggest some possible ways forward for policymakers looking to control costs without dampening growth of OA. After 12 months, the proportion of research available globally in OA form was 32%; for UK research this figure reached 54%. This last figure is significant, representing the first time that the 50% OA barrier has been breached for UK articles in the Scopus database. These figures include both so-called “Gold” OA (articles published in an OA form in a journal) and “Green” OA (articles deposited in an OA repository). All the numbers are considerably higher in 2016 than comparable figures in 2012, but for the UK there has been especially notable growth in OA adoption. At the same time, OA publications are being used more than non-OA. Whilst data sources are often incomplete, they indicate that OA publications are on average downloaded anything between two and four times more than non-OA publications (for more information on this, please see Chapter 3 of the full report). Figure 1: Proportion of 2016 articles published under immediate Gold OA or accessible within 24 months through Green OA online postings in line with journal policies, global and UK (online postings excludes those of publications published under Delayed OA and illicit postings of AAMs). Click to enlarge. It is clear that open access is becoming more accepted worldwide. In the UK, in particular, the growth of OA has been remarkable – a growth it is reasonable to assume has been fuelled by a policy environment mandating and encouraging OA adoption. The high level of take-up in the UK of hybrid OA options (where a charge is paid to make a given article OA in an otherwise subscription-based journal) is evidence of this, with UK funders unusual amongst their international peers in providing for the full costs of hybrid. Although the data is incomplete, 80% of known funding for OA article publication charges (or APCs – the costs paid by authors to make particular articles available OA on publication) came from Research Councils UK block grants in 2016. So far, so good. But alongside rising access levels, we also see another rise which is less positive: rising costs. Whilst the data is patchy and comes with caveats, it shows a pretty clear picture – costs are increasing, and at a rate considerably above inflation. This is the case at both the unit and aggregate level. As far as individual APCs are concerned, costs per APC paid by a sample of ten institutions rose by 16% between 2012 and 2016, while the consumer price index (CPI) rose by about 5%. The average APC was £1969. APCs for hybrid journals, averaging £2095 per APC, remained considerably higher than fully OA journals, averaging £1640, although the gap between them is narrowing. Overall, hybrid APCs represented around 70% of the total number of APCs in 2016. Figure 2: Number of APCs and mean APC cost by journal type, 2013 to 2016, at ten institutions (Cranfield University, King’s College London, Queen Mary University of London, Royal Holloway – University of London, Swansea University, University of Birmingham, University of Cambridge, University of Glasgow, University of Liverpool, University of Sussex). Click to enlarge. Numbers of APCs paid showed rapid growth between 2013 and 2016 as adoption of OA gained traction. The ratio of expenditure on APCs compared with journal subscriptions (the traditional way of paying for publications) for our sample of institutions and major publishers has moved from 19:1 in favour of subscriptions to 6:1 between 2013 and 2016, although there are big variations between institutions. Our analysis shows some evidence of so-called “offsetting” deals, where the costs of APCs are taken into account in levels of subscriptions charged (and vice versa). Offsetting mechanisms vary significantly between publishers, and can operate at local, national, or global level. This complexity means that the role of offsetting remains unclear in our data. Although the value of offsetting to the UK’s higher education sector in 2016 has been estimated at £8m, it is certainly not holding steady the costs borne by UK institutions. Instead, over the last four years it is clear that costs of both subscriptions and APCs have risen, albeit at different rates, with the aggregate cost to institutions rising by an average of 11% per annum during this time. Figure 3: Total subscription and APC expenditure (in £s), 2016, at ten institutions (Cranfield University, King’s College London, Queen Mary University of London, Royal Holloway – University of London, Swansea University, University of Birmingham, University of Cambridge, University of Glasgow, University of Liverpool, University of Sussex) and seven publishers (Elsevier, Wiley, Springer, Taylor & Francis, Sage, Institute of Physics, Royal Society of Chemistry). Click to enlarge. This creates a dilemma for UK policymakers. Whilst it might be argued that their policies are driving the rapid rise in take-up of OA, it is clear that there is a price being paid for this in the form of rising costs. How should policymakers respond? Are rising costs a price worth paying for growing adoption levels of OA? Can costs be constrained in any way, and would this run the risk of dampening growth of OA? It’s important to emphasise that our report does not address the policy options, and was designed only to provide an independent, evidence-based picture of the current situation. It seems to us, however, talking in a personal capacity (and not representing our co-authors), that there are several policy options now available. 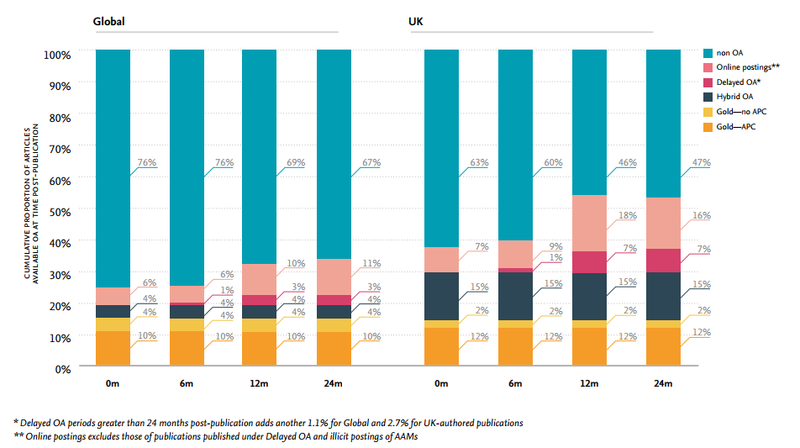 The first would be to “double-down” on the UK’s commitment to Gold open access, with a view to making the vast majority of the UK’s output immediately available on publication. Achieving an outcome where all UK research was immediately open-access in a relatively short time would be a major achievement, and might be used to justify rising costs. At present, however, there is no clear mechanism for achieving this. Institutions have shown little inclination to meet the costs of Gold open access themselves, while attempts by countries such as Germany to negotiate national open access and licensing deals are proving highly contentious. Furthermore, the benefits to the UK of moving still further ahead of global trends remain unclear. The second is the continuity option. This involves carrying on as we are – encouraging OA adoption in its various forms, and funding immediate OA where publications arise from Research Council-funded projects (alongside those from Wellcome and other public and private funders which support immediate OA). This is likely to result in continued growth of OA, but at a lower rate than we have seen to date, given the long tail of publications which have no external source of funding for APCs. The concern with both of these options is that the UK higher education sector will remain exposed, to a greater or lesser extent, to the spiralling costs seen over the last four years. The new Minister for Higher Education, Sam Gyimah, will have to decide whether he wishes to continue his predecessor’s stated aim for the UK to pursue a “preference for Gold routes where this is realistic and affordable”. We would, however, argue that double-digit year-on-year cost increases are becoming increasingly difficult to square with this goal. A third option is therefore to withdraw completely from funding hybrid APCs. This is the position of many funders in Europe who complain of “double dipping” in relation to publishers receiving rising income from both subscriptions and APCs. The Research Excellence Framework’s Green OA mandate offers a lower-cost route to open access, after expiry of any embargo period, for example, while support could be retained for fully OA journals. Embargoes, increasingly associated with Green OA over the last five years, remain controversial, of course. Recent moves by a small number of publishers to remove them have not been matched by the majority, and the outcome of more radical attempts to bypass embargoes, by introducing a licence which negates them, remains too early to call. Nevertheless, Green OA (with or without embargoes) combined with support for fully Gold journals only, could enable greater alignment between the different arms of the UK’s dual support funding system, which are due to be brought together under UK Research and Innovation (UKRI) on 1 April 2018. Whilst this approach might help to address the apparent “double dipping” problem, it would inevitably limit the growth of immediate OA – most of the growth in the UK has, after all, been due to take up of hybrid. Furthermore, it would appear a retrograde step to those researchers supported by RCUK who have come to accept immediate OA publication as the norm, but in the main continue to prefer hybrid journals over fully OA publication venues. We would argue, therefore, that the UK might take a more sophisticated approach to hybrid. Rather than withdrawing completely from funding hybrid APCs, it should be possible to set conditions under which they could be funded. In particular, it might be possible to pay hybrid APCs only to publishers which have an “approved” offsetting deal in place. Since the UK negotiates offsetting deals nationally through Jisc Collections, identifying approved deals ought to be possible. Once they have been agreed, payment of hybrid APCs could then continue in many cases. This option may dampen current levels of growth in take-up of OA, and care would be needed to ensure it does not unduly favour the largest publishers, who are best-placed to negotiate an offsetting deal. However, it could help to ensure that the hybrid model is doing its job as a transition mechanism towards achieving greater OA, rather than simply being another income stream for publishers. It is as a transition mechanism that the Finch Report of 2012 recommended funding of hybrid APCs, and so it might be argued that this approach would be a natural continuation of that Finch position. This approach could still be usefully combined with the promotion of Green OA, in accordance with the REF mandate. The realities of the policy environment are complex and controversial, and the UK is only one player in the global landscape of scholarly publishing. UK support for immediate open access is broadly in line with wider European policy, with the European Council of Ministers setting a goal of immediate OA as the default by 2020. Yet there are multiple pathways to this goal, and Europe’s enthusiasm for immediate Gold OA is not replicated in North America and Asia. Our report and a number of other similar evidence-gathering exercises have been commissioned to inform a review of the UK policy position which is likely to take place in the first few months of 2018. As UKRI is launched, there will be pressure to improve alignment between UK funding bodies, and their respective strategies for supporting Green and Gold OA. As we have argued, there also needs to be serious consideration of (but not a knee-jerk reaction to) the cost increases seen in the recent past. Yet we must not become preoccupied solely by local considerations. The move to open access, and indeed open science, is a global endeavour, in which the UK has played a leading role to date. We should continue to be ambitious, and to be active participants in the international move to open up research to the world. The report, “Monitoring the Transition to Open Access“, was recently published by Universities UK. UUK commissioned a team of researchers, led by Michael Jubb (of Jubb Consulting, and formerly of the Research Information Network and the AHRC), and including researchers from Elsevier, Research Consulting, and the University of Sheffield. The full report is available to download from the Universities UK website. Featured image credit: Coins by Rodrigo Amorim (licensed under a CC BY 2.0 license). Stephen Pinfield is Professor of Information Services Management at the University of Sheffield. He has a particular interest in scholarly communication, open access, research data management and digital library development. He was founding Director of the SHERPA open-access initiative. Rob Johnson is the founder and Director of Research Consulting, a mission-driven business which works to improve the effectiveness and impact of research and scholarly communication. He tweets @rschconsulting.